Home » Family Fitness » Gym » Health » Swimming » Work-Life Balance » Because it is Totally OK to be "That Mom"
Admittedly, before I became a parent, I routinely "judged" other parents, sometimes quite harshly. I may have judged them based on how they or their kids were acting, or based on what they were doing, wearing or eating. In retrospect, and in the moments that I catch myself starting to judge now, I remind myself that being a parent is actually very, very difficult and that most of us are just doing our best and need all the empathy and support that we can get. Amen. Today, as I was doing something that was apparently quite judge-worthy (I will describe later), I was reminded of the time that a former co-worker shared with me that she did sit-ups and other exercises on the sidelines while her son was at soccer practice. As I was childless at the time, my snarky inner dialogue went something like this "Wow, how obsessive can you be?" Now, as a parent of two young children, I would most certainly be thinking/saying "Of course you do! When else would you fit it in? Do you also run laps around the field to get some cardio?". Now that the days are longer and warmer, I have switched from taking the kids to dance/gymnastics on Wednesday evenings to taking them to the swimming pool at our gym. We spend an hour or so splashing and swimming around and then partake of the family dinner night and kid activities that the gym offers on Wednesdays. This is now one less night that I have to worry about dinner (even if the gym food isn't that healthy or great - don't judge), and this schedule actually benefits both my husband and I on the commute and work fronts. I also just love this unstructured time to simply play and have fun with the kids outside of the normal weeknight drivedinnerbathbed routine. The pool set up at our gym is pretty cool in that, in addition to heated pools, they have a little water park area (think slides and fountains) for the kids to play in where the water is no more than 1.5 feet deep. 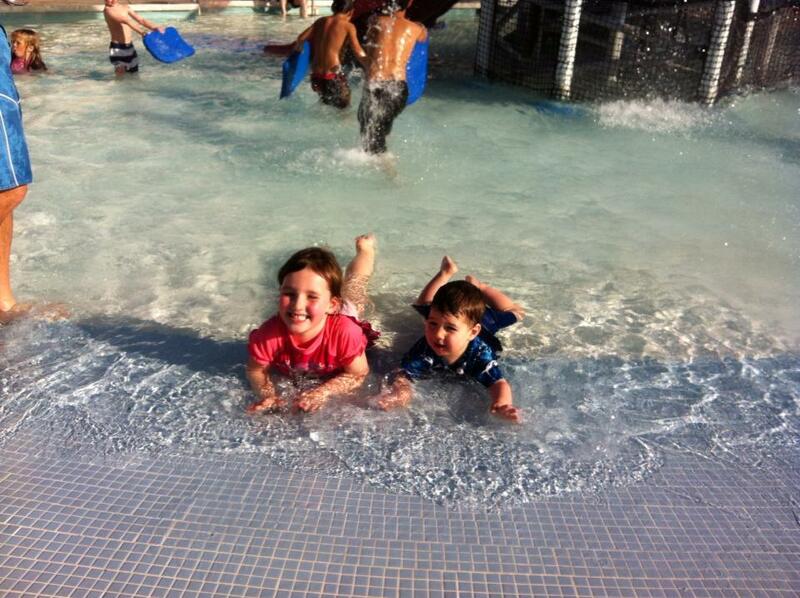 We always start our pool time there to allow the kids to play and get used to the water at their own pace. Then after about 30 minutes, we transition to the deeper pool to work on swimming skills. The real pool part is a little more challenging for me, as neither kid is particularly water safe and it is two on one, but we are having fun and making it work. The thing in all of this though is that while the kids are getting a fantastic hour-long workout, other than playing sherpa, I wasn't getting any exercise out of the experience. As this schedule is new for us, I hadn't worried too much about it for the last couple of weeks, but for some reason today I was really keen to move. It wasn't much (15-minutes or so), but it was fun and gave me a few minutes of desperately-needed self-care time. It was especially great when my daughter voluntarily got out of the pool to join me for the plyo jumps and the wall sits, and to watch my son do his own version of the plyo jumps in the water. Reps of 10 was key so that I was able to readily maintain my interactions with the kids throughout, capture stray balls, and assist with sliding, as needed. I know I raised a few eyebrows, but thankfully the pool deck wasn't that crowded today. I also appreciated the few knowing or wistful looks I got from some of the other bystander moms. Here's the thing - haters are always gonna hate, but the next time you see me doing pushups or lunges next to the kiddie pool (or the soccer field for that matter), don't judge me - join me, and I promise to do the same for you.